Elisa and I were off and running yesterday. We went to a Block of the Month club inWoodland at 10 a.m. We are doing an Around the World quilt. Each month the teacher, Sherrie Werum, brings a block with a notable site from somewhere around the world. Yesterday we did the San Francisco Golden Gate Bridge. She shows us a different technique for embellishment each month. Yesterday it was using glitter on the block. It is a special very fine glitter made for fabric. You also have to use a special glue. It really looks good on the quilt. I will use this technique again in the future. Afterwards we had lunch in Woodland at Morrison's Deli. Yummy food. If you are ever around there, you have to go and have lunch. They close at 2:30 p.m., so don't plan on dinner. Then we went to a quilt store we had never been to before. It is Quilter's Corner in Sacramento. It is in a business district, but easy to find and has lots of parking. It is a good sized store with lots of beautiful fabric. A little bit of everything there. All the fabric is very well displayed. Pricing is good, too. There was lots of Halloween fabric, which is my favorite. Since I have enough fabric to start a small quilt store, I did not need anything. But I found an off white sun bonnet Sue fabric that is very charming. Since I do not have a need for it, I bought three yards for just in case. No wonder I have enough fabric for a quilt store. I cannot resist fabric. I also bought several fat quarters. You can never have enough fat quarters. Quilter's Corner also has a lot of great kits. Elisa wanted one but talked herself out of it. Then they told us that on August 21st everything in the store will be on sale for 20% off. I think we will be going back then. Best of all they have a great class list. I may even take a class myself. For more information on this quilt store, go to http://quilterscornersac.com/. Oh and when you go there, make sure to check out their restroom. It is absolutely the cutest restroom I have ever been in. I tried to take a picture, but my camera would not work.Go see for yourself. Hey everyone. Next Saturday and Sunday is the bi-annual quilt show in Valley Springs, near Volcano (near Jackson) CA. It runs July 17th and 18th. To find out more about this quilt show go to http://www.loosethreadsquiltguild.com/QuiltShow.html. 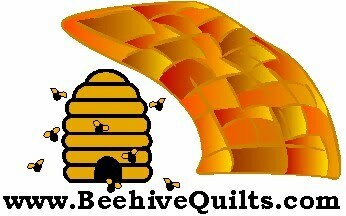 Beehive Quilts is an advertised vendor for this show. Due to the move we recently made, we will not be there as a vendor. We are going up Saturday afternoon to see the show. 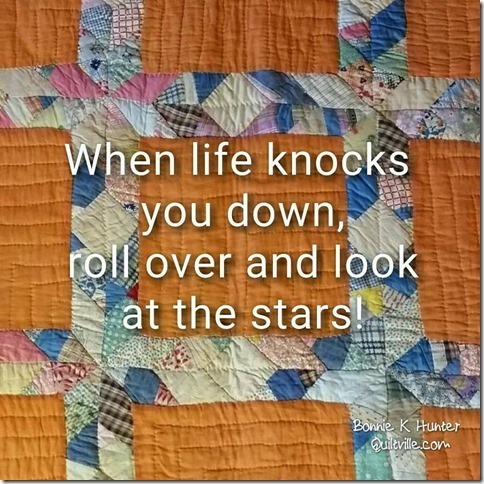 I understand it is a great location and fun quilt show. Why don't you come, too? Well it has been a long time since I have posted anything on the blog. Sorry for the delay. My husband and I decided to move, found a house and moved. Just that quick. Now we are still unpacking boxes. My long arm machine is in several different parts. My sewing machine is on the floor in the dining room. My material just today (after almost a full month) is finally on shelves and ready to use. My thread is somewhere. I saw it once, so I am sure I will find it again. Needless to say I will be glad to get my sewing studio all unpacked and organized. I will send a picture when it is completed. I can not send one of where it is right now, as I would find it terribly depressing to see it on line. Quilt something for me this week since I cannot.